I’m tweaking the pattern like crazy – mainly because I prefere the gauge I got, rather than the gauge I need, and to satisfy my general ‘knit everything at the same time, rather than in parts’ habit. I’m amazed that I’ve almost completed the body already. 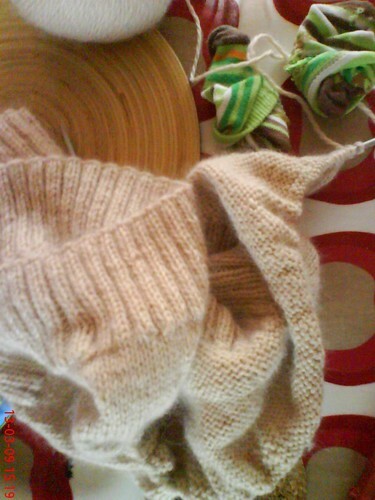 On a good night I get about an hours worth of knitting done between FB going to bed and my turning in for the night. I don’t have the energy for much else at the moment. Ooh, it looks so pretty, and *soft*. That looks so lovely. I love Norahs designs and am going to start something from her patterns soon. Can I ask what is happening with your shop? I haven’t seen an update or new yarn in ages…have you stopped dyeing and selling yarn? Things have been pretty quiet, and i haven’t got back to dyeing as quickly as i hoped to. But Oxford Kitchen Yarns still exists and i’m working hard to work out what that means for my family as it is now. I’ve definately got some plans, and some new lines that i’m working on. In the meantime i do have a few things to put into the shop, and hopefully that’ll happen very soon. thanks again – you comment was a gentle kick in the bum that i needed, and i really apreciate it. seriously.